A desert island book is a book which you - as only book - would choose bringing to a desert island. An interesting question for a chess player is which chess-book would you for sure put in the suitcase (we don't accept an i-pad fully loaded with pdf-files). Implicitly we mean: " which book did you enjoy the most " or you can also interpret this literally. Which book would give you the most pleasure on a desert island - which probably would generate a different choice. It is very well possible that a book made a big impression but has no great value on a desert island, while maybe an average book about endgames, studies could provide many hours entertainment. For sake of easiness we assume that there is enough time to make a board and pieces. Maybe with some luck something comes ashore - another advantage of a chess-player: chess-materials float (unless you prefer weighted pieces) . But let us not force the issue and agree to select 10 books to make our live on coconuts and crab more enjoyable. 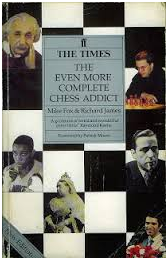 It is well possible that I saw the concept of "a desert island book " in one of the books which surely pops up in my shortlist The Even More Complete Chess Addict from Mike Fox and Richard James. It is a fine book, with relatively few games but more anecdotes and original material. It resembles the work of Tim Krabbé, but it is fully independent. It includes a pinch of “Guinness Records”, but it is more than just that. I found it recently back in one of my moving boxes and when I saw it back after many years it was a small disappointment : was it only that? Immediately a nice illustration of the double position from the beginning of this article: what is a desert island book... Nevertheless it was still a nice refreshment of trivia and about anything happening at the boarders of the chess-world. There is a list of best problems, studies, games - almost a summary of what each player should know from technical perspective. A very enjoyable reading the first time but you won't read it 5 times. 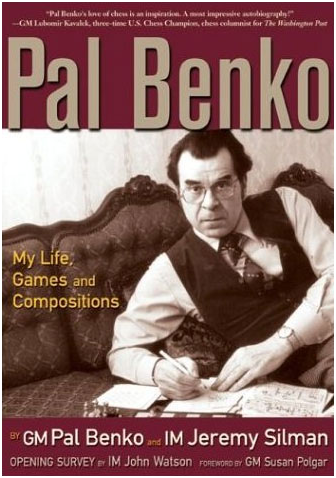 A second book on my shortlist is the biography of Pal Benkö. It is a very beautiful work, hardcover, good layout, diversity with pictures and biographic material. A lot of games with diagrams so a lot to read. Benkö also composed studies and tasks so something which will last for years on the island. A third book which I surely consider is De Koning. I can't recall anymore the number of times I reread the book. Once I copied the book page after page, later bought it in English and eventually got a nice second-hand copy in Dutch. It remains a milestone in chess-literature but should we really thank Krabbé and Pam with their selection - is this really the best of Donner? I don't know - were his other articles also at the same level? Maybe there were more timebound, maybe of less quality, maybe more boring (although difficult to imagine). It can't be a bad idea to make a “De Koning 2” even if just to have a more complete view of Donner the chess-author. If the book of Benkö belongs to the top 5, then this one too. This book guarantees long afternoons and evenings under the palm-tree without feeling the hunger or getting the reflex of running to the not-existing refrigerator for a fresh white whine at the sunset. What is the strength of this book? Primary the analyses which are at the same time thorough as easily accessible. The lines are checked by the engines. They are not endless but explained verbally. The many diagrams support the text. The introduction, pictures and considerations complete the book. Number five is VanPerlo – maybe the funniest endgame-book which I ever had. However here I start to hesitate: although more than 1100 positions are included, maybe the content is rather weak in the prospect of years on the island. You could study 1 position each day but it is very difficult to put the book aside after just 1 position so very likely you cruise through the book. If my house burns down and I must save books then very likely I bring the numbers 2 till 5 first into safety. Number six will be a book of Kasparov - but which one from the series? The first, without any pretensions looking at the beautiful classical era of the first professional chess but of which the analysis aren't faultless? The book Revolution in the 70’s – which is a nice mix between theory and history? The book of his first long match with Karpov? Or the one about Fischer? I prefer Rev in the 70’ies. You never know if I meet Friday on my island, by coincidence also able to play chess. Some opening-knowledge can be pretty handy. And that book of Kasparov is a real masterclass in openings. Number 7 - I have to choose somewhere a good openingbook, the last one came close but is no 'real' openingbook? But which one? The twin-book from Shipov about the Hedgehog is breaking the rules - no 2 books. And the 2 books about the Sicilian Dragon from Schneider: pity, but the same. My first chess-book, the one from Unzicker (Thieme’s nieuwe schaakboek) mainly covered openings but is rather weak compared with the above mentioned masterpieces. I really like the book but I fear that I will not look at it anymore after a week on my island. Of course the problem is that I never really studied well openings - a minor interest for the Sicilian dragon, Centergambit as white, Scandinavian and Kan as backup and in fact except Benkö nothing concrete against 1.d4. Against 1.c4 I play symmetrical English because of the vague resemblance with other fianchetto- openings with black and especially because the mainline is easy to remember. But an opening-bible? I believe the opening-vademecum from Roessel is a nice little book, a good balance between simplicity and details, but it is not very crucial. So no opening-book? Ach, why not - Friday will likely play like a turtle and if necessary we start from scratch and skip openings. So no number 7. 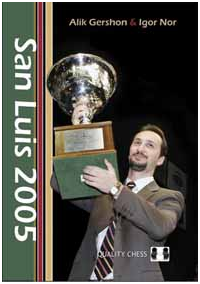 Number 8 - I still need a tournament-book. I am a big fan of tournament-books and Caïssa editions provided quite some good materials, old tournament-books very nicely republished but with a modern flavor (engine checked analysis). 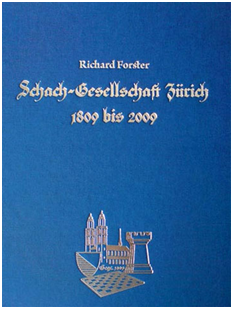 But the book of IM Forster (one of the rare authors not despised by Winter) about the chessclub of Zürich can't be ignored. A great reading, a lot of games ( imagine: players over a time-span of 150 years are presented often with their most beautiful game, and this decorated with lots of materials about tournaments in Zürich). It is one of my favorite books. Number 9 - yet another biography, but which one -McFarland has a strong series. The book from Winter about Capablanca is a classic, but I've always been very charmed by the one from Soltis about Marshall – very readable and a good mix between games and biographic info. And the gigantic biography about Amos Burn – pity, but again 2 books in the English publication of McFarland (The German copy is 1 colossal book). The book from Soltis brings Marschall to live, something in which he didn't succeed with the book about Botvinnik. It represent a nice - although sometimes summarized - look at the live of one of the last bohemian players from before WOII. Number 10 is a bit cheating: a bookbinding of the magazine Kaissiber from Stefan Bücker. 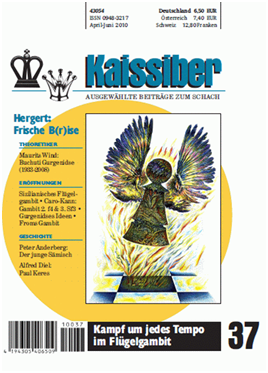 I also have a year-bookbinding of British Chessmagazine, but the timebounded character of a normal magazine is less interesting than the very readable Kaissiber, which besides also covers some very rare openings (do you know the Vulture or the Habichdich ?). Above collection represents well my interests: I like chess but I still like more reading about chess, the history, how the famous players lived but also the rather peculiar sides of chess. What did I miss? Maybe a chess-novel - there exists already quite some readable work of acceptable level. From Stefan Zweig to Nabokov, just to mention the 2 most known ones. Or books about chess - I think about the oeuvre of Tim Krabbé or HansRee. But as I dropped number 7, I still have 1 spot left in the (already heavy) suitcase. Maybe I keep this for a favorite book of the readers of this blog and I discover a beauty of which I never heard about the existence - a special treat for the first evening at the shores of my island.